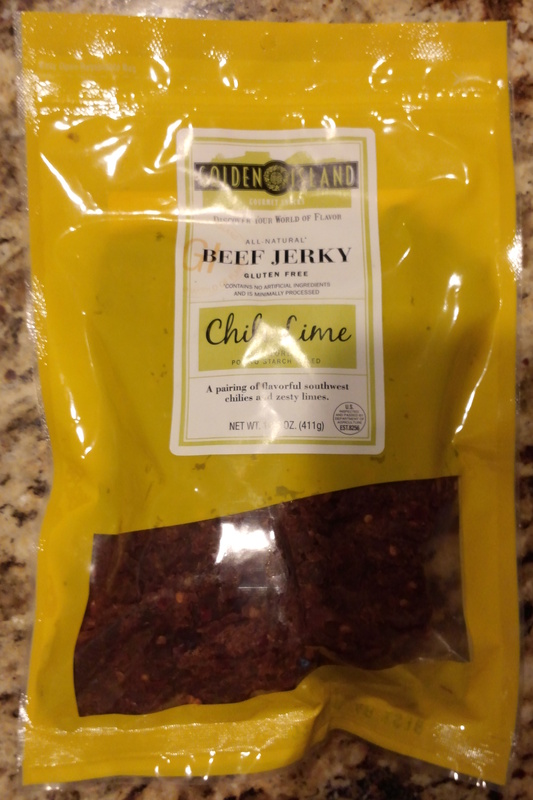 For this round of Jerkyological evaluation we’re tearing into a bag of Golden Island All-Natural Chili Lime Beef Jerky procured from the Costco jerky assortment. Taste (A): First: wow, they totally nailed it! This is what Chili Lime is all about. The lime flavor leads the charge and it is both deep and powerful. This isn’t a ‘lime flavor’ added to the jerky but rather a real-deal full-on lime taste that leaves you looking for the peels. The sweetness quickly follows, a clean and simple sugary goodness that wraps itself around the lime and makes it even more enjoyable. Once your mouth takes all that in you get to the chili flavor. Here again is excellence in execution. The chili taste seems a bit additive at first, almost like a tag-along hanging around the edge of this mouth-party, but after a few moments the dance begins and it joins into the mix and delivers just the right bit of lingering heat that brings everything together. It’s just fantastic and is possibly the best chili lime flavor we’ve ever seen in a jerky. Ever. Texture (A-): This is a tender, moist jerky that bends and tears easily and is easy to chew. The pieces is cut along the grain and has an almost tattered seeming surface. It feels really nice. Good stuff. Smell (B+): This jerky’s scent is all about the citrus. The citrus smells – there are lemon and lime at work – are balanced in a truly expert way. The lemon scent stands out a bit above the lime, but together they offer up a wider range of nose notes. After enjoying the citrus scents for a bit the sweetness starts to come through and, at times, evokes memories of Girl Scout cookies and other childhood joys. It is an excellent complement to the flavor of this jerky and definitely does its part in the jerky experience. Appearance (B+): This jerky looks a bit rough at first, but once you have a few pieces and understand what you have you start seeing it for what it is and it looks pretty good. The pieces are general pretty good sized, cut slightly thickly, with some nibble-sized bits mashed in the mix here and there. They’re a darkish brown color with a red hue throughout and the surface has a ragged sort of texture. There are tiny bits of chili and peppers scattered across the surface as well, adding visual interest. All-in-all, it looks good. Consistency (A-): The flavor of this jerky is spot-on throughout the bag; the balance of the flavors and their overall intensity is expertly delivered. The moisture, too, is delightfully consistent from bite to bite. Importantly, given the tough time we had with the Five Spice flavor, the meat in this bag is cut with a nicely uniform thickness and there were only a few bits of gristle to be found. This is an expertly made jerky. Overall Impression (A-): We have a winner! 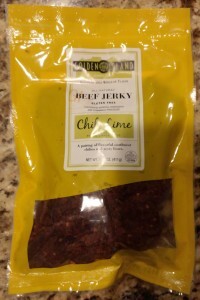 This Chili Lime jerky is an absolute joy and a welcome departure from the usual assortment of jerky flavors. The flavor is just fantastic, with depth and balance that point to genuine skill, and the pieces feel every bit like the quality beef they are. Not everyone is going to go for the chili lime flavor itself, but if you’re at all a fan (or you just have the curiosity to give it a whirl) you’re going to love this stuff. Grab a bag… grab several… and dig in. Eat well! Tagged artisan, beef, chili, gourmet, lime, sweet. Bookmark the permalink.